This time last fortnight the Institute was pleased to host a lunch that brought together key stakeholders across the property industry to explore emerging opportunities from the nascent build-to-rent sector in Australia and the establishment of the Federal Government’s new National Housing Finance and Investment Corporation (NHFIC). The Institute’s National Policy Manager, Leanne Hardwicke, and I were joined by visiting international housing expert Piers Williamson, Chief Executive of the UK body The Housing Finance Corporation (THFC), together with the Chair of peak community housing industry association PowerHousing Australia, Nicola Lemon of Hume Community Housing. 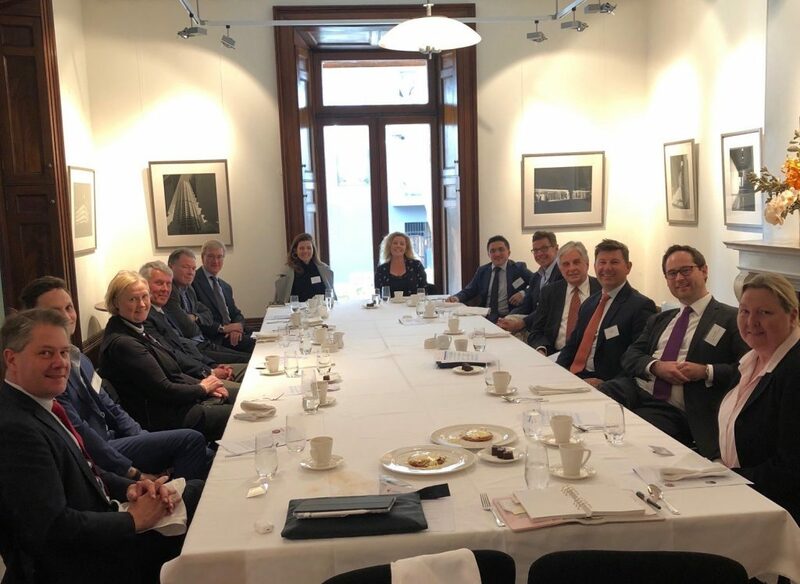 A number of PowerHousing board members, including Scott Langford of St George Community Housing, as well as senior executives from Australia’s biggest residential developer and diversified property company, Stockland, also attended. The lunch was an opportunity to pool ideas, experience and expertise from executives across Australia’s housing spectrum. The Institute has been a vocal advocate of policies that promote improved housing choice and affordability, as well as investment in infrastructure and placemaking measures to sustain the liveability of our growing towns and cities. These advocacy objectives were shared by those around the table and together we have agreed to continue collaborating on this important issue. The NHFIC, which commenced operations on 1 July this year, will shortly call for project applications under the two financing streams it administers, the $1 billion National Housing Infrastructure Facility and the Affordable Housing Bond Aggregator. Its mandate is to support the construction of more affordable homes across the country. Build-to-rent housing could conceivably form a major component of the new projects financed. The UK experience demonstrates the huge potential of the build-to-rent asset class. With strong support from both government and the private sector, the build-to-rent sector has gone from non-existent a decade ago to now having more than 124,037 units of build-to-rent housing either completed, under construction or in planning. Build-to-rent developments typically are delivered at significant scale in order to be commercially viable, as the UK and also the US markets have shown. We believe architects have a critical role to play in the delivery of this new pipeline of build-to-rent and affordable housing to ensure good design, sustainability and placemaking are all properly considered and incorporated to maintain quality. We will continue our engagement with the new Morrison Government to ensure architects have a strong voice in Australia’s housing future.